May 23-26, 2016, JSC Informacinė raida“ took part in international breakbulk and project cargo logistics exhibition “BreakBulk Europe 2016” in Antwerp, Belgium. 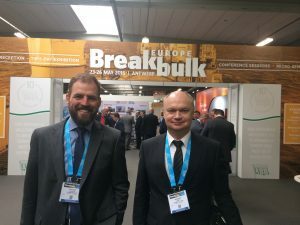 Breakbulk Europe is the largest exhibition and educational forum in the world addressing the needs of traditional breakbulk and project cargo logistics professionals. The four-day event offered industry workshops, a conference featuring leading breakbulk and project cargo experts and an exhibition showcasing a range of both international and European companies. Exhibitors and sponsors included specialized ocean carriers, freight forwarders, ports/ terminals, logistics providers, ground transportation, heavy air, export packers, equipment companies and more. During the exhibition there was an ideal opportunity to make new contacts with potential ports, forwarders, transporters and other cargo specialists and industry experts, to meet with the customers, to discuss and learn directly about developments and trends in the area of breakbulk and project cargo.